Is Leicester a bike-friendly city? Leicester Mercury article reporting on the Cycle City Active City conference (19-20 May 2016), quoting LCCG’s Eric Ludlow on our view of the progress being made towards ‘making cycling normal’ in Leicester. LCCG response to Leicester Mercury First Person piece ‘Why do so many people hate cyclists’. On behalf of the Leicester Cycling Campaign Group (LCCG), I congratulate the anonymous cyclist behind the First Person piece “Why do so many people hate cyclists” (Mercury, May 25). Her experience of anti-cyclist sentiment over the past seven years will have rung a bell (no pun intended) with many people, and her analysis of the psychology behind it was illuminating. But “Anonymous” is something of an exception, in that she continued to ride her bike, despite abuse from motorists. For many new cyclists venturing cautiously on to the roads, just one bad experience can shake their confidence enough to send them on to the pavement, or their bike back into the shed. A “close pass” or a shout of “get off the road!” can undo all their enthusiasm and spoil what should be a liberating and pleasurable experience. That is why LCCG is campaigning for segregated cycling facilities in Leicester. 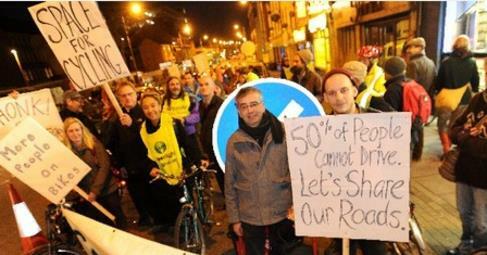 Separating people on bikes from motorised traffic is crucial if Leicester is to become a genuinely cycle-friendly city. And that means creating high-quality infrastructure, not simply painting lines on pavements. Not all roads are suitable for segregation, but the arterial roads into Leicester are. Elsewhere, LCCG would like to see a dramatic increase in the number of 20mph zones and more pedestrianised but cycle-permeable streets. These measures would increase the numbers of people cycling, reduce congestion and cut down pollution. So, Anonymous, if you’re not a member, would you like to join LCCG and add your voice to the 200-plus people who are actively campaigning to make Leicester a better city for cycling? Eric Ludlow, LCCG press officer. Read the story for yourself and, if you like, add a comment on the Mercury’s website. Lots of coverage on local media, starting with Jim Davis and Jo Hayward’s show on Radio Leicester in the morning (starting at about 2:08, including LCCG’s Elizabeth Barner, Steve from Healthy Air Leicester & Leicestershire and Mark Radymski, the person who started the anti-petition). A not-great piece on East Midlands Today (starting at 14:00, and available until 7pm on Tuesday 11 November). Well done, Anna, for getting our points across despite some dodgy stats, misinformation and opining from the reporter. Leicester Mercury’s piece includes lots of quotes from YOU lovely people – thanks again! Our Press Officer, Eric Ludlow, has written a thoughtful piece following the recent deaths of cyclists in London, reflecting on what we can learn for cycling safely in Leicester. It is published in the Leicester Mercury’s ‘First Person’ column. Six cyclists have been killed in London in the past three weeks. That’s a chilling statistic and there’s no escaping the deeply emotional impact that it creates. It has led to demands for a range of measures to be taken immediately – some aimed at cyclists, others at motorists. I would prefer to look at what might have caused those deaths and its implications here in Leicester. Campaigning cyclists have warned that new bike paths outside a new supermarket are obstacle courses which will lead to people being injured. 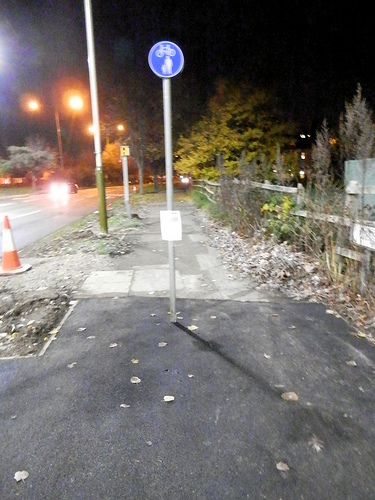 David Warnock, a member of the Leicester Cycling Campaign Group, says that signposts, a lamppost and control boxes are blocking the footways – paths shared by cyclists and pedestrians – near the new Sainsbury’s store, in Melton Road, Rushey Mead. A major public relations operation accompanied a Government announcement on cycling investment on Monday. David Cameron was pictured with Olympic stars Chris Hoy and Victoria Pendleton as he pledged £77m to improve cycling routes in a number of cities around the UK. The Prime Minister said the investment marked the start of a “cycling revolution which will remove the barriers for a new generation of cyclists”. The bad news, however, was that Leicester’s bid for a slice of this investment was unsuccessful. Leicester has failed to win Government funding to improve cycling routes. The city council submitted a detailed bid to the Government to gain a share of its £77 million to promote cycling around the country. But it has been announced that cities including Manchester, Leeds, Birmingham, Newcastle, Bristol, Cambridge, Oxford and Norwich will receive cash, but not Leicester.